I've found that some of my happiest days are the days I ride Francie. I never stop being surprised by how far she has come. She's gone from a size 38 girth that was too big to a size 48 girth that is just about right. She's outgrown her first bridle. And while her growth is still stunted, she has grown some and filled out a lot. But more than her growing are all the things she has learned. I couldn't even touch her in the beginning. She'd never seen a farrier or a vet or been led around. She'd never felt so much as a saddle pad on her back. She's an old pro now at these sorts of basic skills. 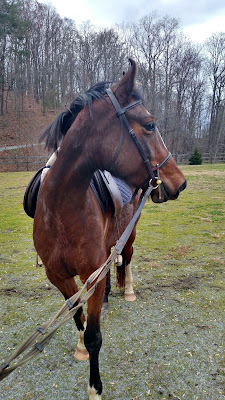 Some of the big things we have worked to accomplish under saddle are: Francie will stand to be mounted. She will walk, trot, and canter (we are still working on leads). She will leg yield or side pass (she is better one direction than the other). She knows how to back (but is sometimes crooked). For a while, I have been working on having Francie stand still while I lean over to open the arena gate, then back away while I pull it open, then walk through. On the day I took this picture, Francie finally accomplished this in a calm mannered way. So we walked through, and then we walked around some of the open pastures. This was the first time I had ridden her outside the arena. She was a little scared at times, especially when I made her walk around a bonfire Paul had going in one pasture, but she trusted me when I told her it was okay. Every time I ride, she seems to come a little further. Who knew I could've fallen for a mare (I usually only like geldings - less drama), and a gaited one at that. But Francie has a lot of heart, and I love her for that. You have worked with her well.Amazing all the progress. She looks good, she wouldn't have survived if she had not been rescued. Our horse is covered with burdock burs at the moment but he is getting plenty of grass as it is a good year for that. She is gorgeous and it warms my heart that she trusts you. Have a great weekend! What a beautiful horse. I'm so glad you came into the picture to rescue her. I don't know anything about training horses but can tell you are an expert Lisa! Francie appears to be a beauty in the making and obviously trusts and loves you to do all those things. Kudos to you for your patience and caring - horses are such beautiful animals . I would love to have learnt how to ride a horse, but I think that that experience will have to wait until my next life time! Would not mind getting up on a horse but it is the getting down which would be a problem, especially if I was to part company with the horse suddenly! She's amazing, Lisa, and as you say she's come such a long way. I'm glad you have her and she now has a wonderful life. Hooray!! I can't believe how far she has come! Thank you for taking her in and giving her such a good life. She's been a good addition to the family. My daughter enjoys her rescue horse very much too. Yes, you really have come a long way with Francie... and she has gained comfidence,, all becasue of you. You've come a long way indeed! Congrats.. that takes a great amount of patience - she is a lucky lucky girl. What beautiful news on Francie. I'm so happy for both of you. Your relationship with Francie sounds amazing. You two have made so much progress working together. She sounds very sweet. :) Thanks for sharing! oh my Lisa, isn't she a lucky girl, you too I imagine that she and you have a special bond and just being in her company is a gift...do give her my congratulations for being so brave and learning to trust and love..big hugs to you!!! Happy Holidays to Francie, you and yours! I remember when you first got her. She wasn't well. You have nursed her back to health and I bet she loves you as much as you do her. And she loves you, Lisa. She has learned to trust because of you. Hooray for Francie! You have done so much for her. You have done a lot of work with her, happy Christmas to you all. that your loving mare, Francie is doing great. She is so beautiful!! You have a big heart for animals and horses, Lisa. I admire you for that. I love horses with all my heart!! All the Best for you, your family and loved ones. You are simply amazing. And . . golly, she is beautiful. You should write a book about this rescue horse. I think it would be delightful! Such a great story. Wow! She has come a LONG way! You have given her so much patience and good, calm training. I'm enjoying catching up on Francie's story.